Our digital age generates a huge amount of information: from a site visit, the online purchase of a product, or when an email is sent – everything generates information that can be used to improve the services your Company offers, especially in light of the fierce market competition and the increasing demand from end users for tailored, intelligent services. 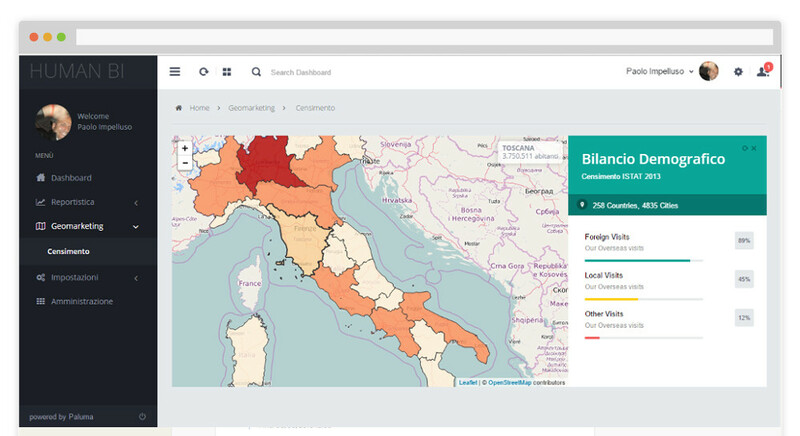 Human BI is a platform that helps you understand and use your data, through immediate monitoring and analysis tools – such as grid reports, graphs and histograms – and georeferenced choropleth maps. Dive deep into the details, by filtering a specific time period, comparing one or more periods, or by analysing certain types of data only. Human BI is a powerful, flexible and intuitive tool. Read data from different sources of information (Excel spreadsheets, Corporate databases, External Applications, etc.) and import them into a single database, which becomes the platform’s core data source. Transforms data into understandable and automatically updated Analytical Tools, such as Graphs, Detailed reports and Geographical Information Systems (GIS). Independently create and manage the users who can access the platform and inform your Company’s collaboration teams through newsletters. Are you interested in HBI? Would you like to request a quote or a personalized demo?